Patricia Wells’ book Salad as a Meal is teaching me so much about non-salad-related things. For example, what is a terrine? I had a vague idea, but had certainly never tried to make one before. A terrine is a meat dish similar to pâté in texture, but is shaped into a loaf and served at room temperature. The word terrine may refer to the food itself or the pan in which it is baked. A terrine is cooked in a water bath so the meat cooks evenly, but doesn’t brown. 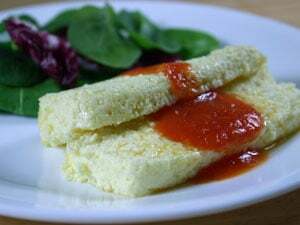 Patricia’s recipe for Ricotta, Parmesan and Lemon Zest Terrine substitutes eggs and cheese for the meat typically found in a terrine which makes it a nice vegetarian option. Basically, you combine ricotta, Parmigiano-Reggiano, eggs and lemon zest and pour the mixture into a loaf pan. You add some hot water to a roasting pan and place the loaf pan into the roasting pan. Bake for 45 minutes, cool for 25 minutes and you’re ready to eat. My terrine tasted great, but I don’t think I’ve fully mastered the technique. I was able to get a few nice slices from the ends of my loaf, but the middle of my terrine was, shall we say, a mess. It looked more like ricotta, parmesan and lemon zest pudding and definitely was not sliceable. I’m guessing that my water bath wasn’t quite the correct temperature during the cooking process. Or, I could have changed the chemistry of the terrine too much with my fat- and cholesterol-reducing substitutions (see below). The terrine is served with a very fresh, easy to make tomato sauce containing olive oil, tomatoes, salt, celery leaves, bay leaves, garlic and hot red pepper flakes. Patricia suggests pureeing the sauce with a food mill, but I didn’t have one so I strained mine using a metal colander. Note to self: invest in a food mill. This sauce had wonderful flavor even though I forgot to add the red pepper flakes in a moment of temporary insanity. Patricia’s recipe for the terrine is a good source of Protein, Calcium, Phosphorus and Selenium although it is high in Saturated Fat and Cholesterol. I switched part-skim ricotta for the buffalo milk ricotta and an egg substitute for the eggs to reduce the Cholesterol significantly. My version is still a bit high in Saturated Fat, but I’m not willing to give up the Parmigiano-Reggiano cheese! The Fresh Tomato Sauce is very low in Cholesterol and is a good source of Dietary Fiber, Vitamin A, Vitamin C, Vitamin K, Potassium, Manganese, Vitamin E, Vitamin B6, Folate and Copper. If you are watching your Sodium intake, reduce the amount of salt used in Patricia’s recipe. Braver woman than I… I lived on duck terrine back when I was in France in December and couldn’t imagine making it. This looks wonderful, Shelby. I’m inspired to try it out. Probably not during the challenge, but I hope we stay in contact and share yummy recipes ongoing. Not a huge fan of terrine but this recipe may be different. Salad as a Meal! Yes, I love having a salad as a meal but my husband hates it. I especially like a salad as a meal if I just made a loaf of fresh bread. Shawnie – I definitely want to stay in touch after the challenge is over! If you try the terrine, let me know if yours has a consistent texture throughout. You are so brave to try making this! I want to try too, but haven’t gotten around to it. I think I’m intimidated. Thanks for the inspiration! Looks gorgeous and delicious.